Update: June 2, 2018– Tariffs against steel and aluminum imports are the latest emergency measures to push up domestic United States’ production for war manufacturing. US borders are closing. Radical deterrence of child-confiscation at the border is not just cruel it is strategic. The US will cause millions of displaced persons becoming a massive migration to which its borders will be closed. US President Trump believes in his missile defence system and is eager for war. Read more about the mid-2018 fears that global war is on the horizon. Shot “Baker” of Operation Crossroads in the Marshal Islands in 1946 — one of the more famous mushroom clouds of all time. Note that the mushroom cloud itself is not the wide cloud you see there (which is a brief condensation cloud caused by it being an underwater detonation), but is the more bulbous cloud you see peaking out of the top of that cloud. You can see the battleships used for target practice near base of the cloud. The dark mark on the right side of the stem may be an upturned USS Arkansas. North Korea says it has successfully developed a ‘Hydrogen (Thermonuclear) Bomb’ and is ready for nuclear war. Kim Jong-un, leader of North Korea, may be telling the truth about North Korea’s thermonuclear bomb test say scientists who understand this technology. It could also be a big atomic fission device. Small thermonuclear weapons are hard to build precisely. A slight miscalculation on a thermonuclear test and the blast is measured in megatons not kilotons. We don’t want to believe that the DPRK has this technology. That worst fear scenario may be true. North Korea possibly did test on Sept. 3, 2017 a Thermonuclear Bomb with the force of 160,000+ tons of TNT says Japanese expert Yu Koizumi. He is a research fellow at the Institute for Future Engineering. North Korea’s test was deep under ground in a testing area dedicated to preparing for nuclear war with the United States. It sent shock waves like an earthquake far and wide. Koizumi’s conjecture matches other experts. He believes the September 3 North Korean test was of a large device and the first of a possible series needed in order to miniaturize the weapon to fit in a warhead of a long range missile. Koizumi suggests that the data collected by the North Korean scientists may be insufficient to create a missile-ready Thermonuclear Bomb. Koizumi thinks there may be more tests. North Korea has threatened a Pacific test. That may fit. 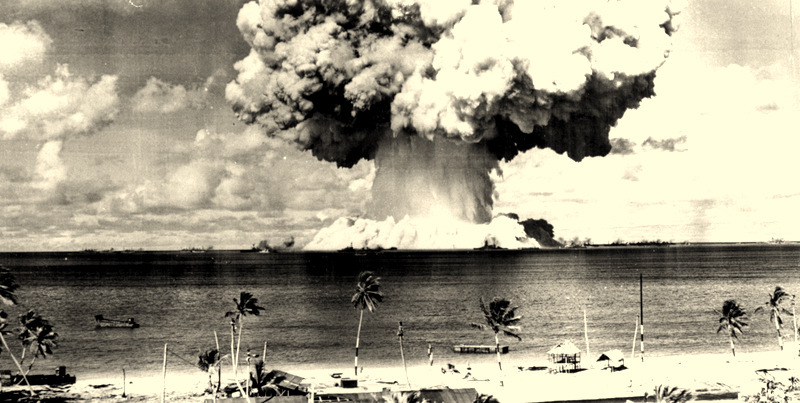 Early photograph of American Bikini Atoll test, Marshall Islands – July 25, 1946. USA is other combatant threatening nuclear war. The United States has established a position that is obviously impossible. It wants North Korea to unilaterally become a non-nuclear nation and as the advice of Vladimir Putin of Russia has clearly stated with good reasoning, that is not going to happen. The United States has bullied its way into controlling the agenda of the United Nations once again as it did when it cajoled the UN into giving the US the authority to govern the islands of Micronesia, some eight million kilometres of the Pacific Ocean the US turned into the “Pacific Proving Grounds” for nuclear testing. Today and since 2006 the UN has ordered brutal sanctions after brutal sanctions against North Korea, starving its people. These people have their guns out and they make threats. The United States conducted many nuclear bomb tests, dozens in the Pacific. Many people were harmed in the islands of Micronesia. Many islands are completely uninhabitable today although many if not most less impacted islands have recovered. Many thousands of Pacific island people the United States describes as “savages” in its historical documents did not recover. We have data on what would happen if North Korea detonates a Nuke under or over the Pacific Ocean. America’s two dozen nuclear tests in the Pacific region of the Marshall Islands were done between 1945 and 1962. Those tests comprised only 14% of the total number of tests it conducted in the Pacific. The US left many people including its own soldiers in harm’s way to observe the effects nuclear bombs have on humans as if it did not know from the atomic blasts at Nagasaki and Hiroshima. 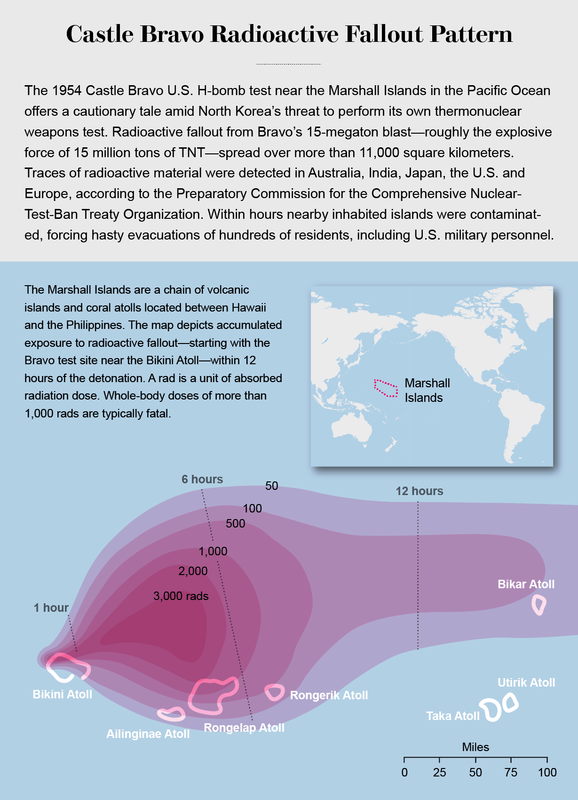 The United States conducted 105 atmospheric and underwater nuclear tests in the Micronesia island region, many of which were of extremely high yield weapons. Why nuclear war with North Korea. Trump has said that he will destroy North Korea and all its people if his administration doesn’t get what it wants. The (possibly senile) mind of Trump, like his administration’s policies, is random and undisciplined. He wants North Korea out of the ‘nuclear club’ of nations. It is too late–the DPRK is a nuclear nation..
Sanctions did not work (they never do) and the DPRK is now a nuclear power. No country that achieved that status has ever backed away. The DPRK says it will not. Wiser leaders in the small, permanent inner circle of the UN Security Council have clearly explained why the DPRK will not back down. It’s not rocket science: North Korea is isolated, threatened and needs the bomb to stay alive. It would have met the bloody, messy fate of Iraq and Libya if it did not walk with a big stick–the nuclear bomb. Kim’s constant threats of nuclear war, however, are unforgivable. The whole of that country is seemingly in agreement. Trump has given himself no position to which his administration can easily withdraw. Trump as a statesman is a catastrophe. He very quickly in his term brought the world to the brink of nuclear war. His mistakes are epic and will only lead to nuclear war unless the USA accepts North Korea for what it is: a member of the nuclear club, not in spite of the USA but because of the USA. This ball has been fumbled many times and the world is preparing for nuclear war. To deeply explain how the world got to the brink of nuclear war there are some theories that need to be aired. You may not like reading this reality that often eludes polite conversation out of fear that “they” are listening and you will lose your job, your insurance, your home and your pension. No biggie. Most of the world does not know what those things are like to have but still carries on day to day with a smile. The philosophy shared by both ruling administrations is that they can no longer reliably contain the threats to their nation’s security and therefore believe preemptive military action is needed. In this case that is a recipe for nuclear war. Not seeing this was Trump’s biggest mistake. Once you start a nuclear war, it is on and there will be no turning back. People seem shocked that Trump’s war of words is so callous and maliciously racist toward the millions of Asians who would be slaughtered by his actions if he ever started pressing those buttons of fiery destruction he boasts about. Trump’s foreign affairs experience is based on his “Duck and Cover” childhood when Americans believed all people of colour were savages. In that era of Trump’s childhood, America ‘exterminated’ millions of Koreans and today, polls indicate that a majority of Americans are willing to do this again. Not much has changed since America fried “savages” with bomb testing in the Pacific. Kim like Trump is neither a proponent of human rights nor a person favouring the advancement of humanity in any way at all. Both say they long for the day when they will kill millions of people on their opposing side in a nuclear war. Kim Jong-un’s authoritarian rule is similar to that of Trump, Duterte, Mugabe, Putin, Stalin, Hitler, Slobodan Milosevic, Saddam Hussein, to name a few. Each of these men created for their masses a fictitious enemy of alleged Goliath evil. The Kim’s (Kim Il Sung, Kim Jong Il & Kim Jnng-un) maniacal manipulation is not so phony however. The North Korean people suffered similar atrocities at the hands of Americans to what Russia suffered from Hitler’s civilian slaughters during WWII. If nothing more today, there is empathy between the two nation’s people. Russia will stand with North Korea. Unlike Trump, Kim Jong-un has his wits about him and is a very clever ruler of North Korea. Kim is a young and very immature inexperienced man and Trump is more than double his adversary’s age but is also inexperienced and immature. Trump seems to have been showing classic symptoms of dementia with his tweets about things that don’t exist. Now he is launching a nuclear war. There are other symptoms that have worried Americans enough that many say Trump is not the leader of all Americans. Meanwhile Kim is the grandson of one of the most noteworthy world leaders in all of history, Kim il-Sung, literally worshipped as a God in North Korea. The United States is hated by the People of the DPRK because of America’s past war crimes. It deliberately slaughtered 30% of the DPRK’s Civilian Population, then bragged about that atrocity. 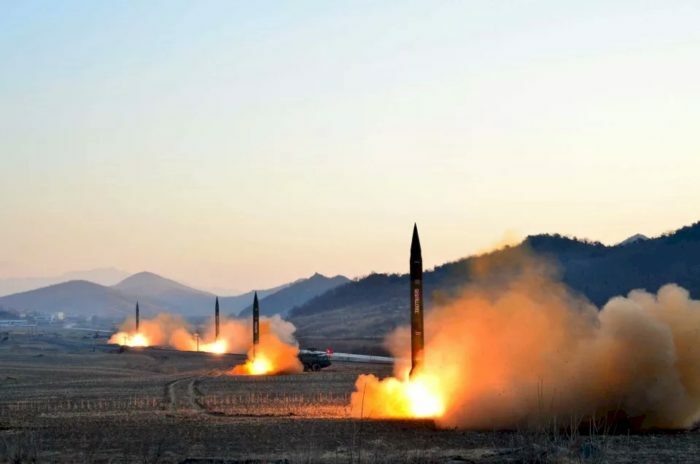 The 25 million ordinary Koreans in the Democratic People’s Republic of Korea (DPRK) are committed to a continuation of war against the United States. It will now be a nuclear war. 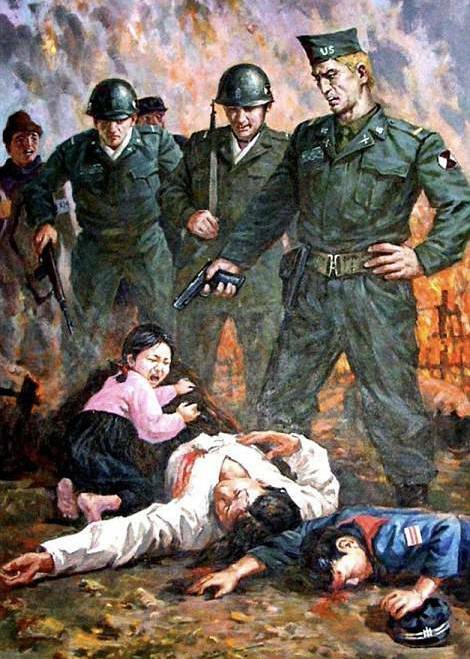 Those who remember the slaughter of their people by the United States from 1950-1953 have told that story a million times or more and everyone in the DPRK feels the pain. Korean war veteran Ed Daily, now living in rural Tennessee was a 19-year-old volunteer with the 1st Cavalry division at the start of the Korean war. He has described how his unit surrounded several hundred civilians and penned them under a railway arch. His unit was ordered to “shoot them all.” They fired for more than 30 minutes: Mr Daily says he saw women and children and old men in his sights. He claimed up to 200 people had been killed by the time it was over. “It started to torment many of us,” Mr Daily told a television interviewer in December 1999. “By the 1980s we started contacting one another, and we were all having the same mental problems. Over the years I went hearing a baby cry, or a woman scream, it triggers a flashback.” [Violently angry, Pyongyang is now promising the “flashes” will be Thermonuclear blasts in America.] Nuclear war is imminent as America’s war crimes catch up with the leaderless nation. America in the early 1950s conducted the most deliberate racist slaughter of human beings in the known history of mankind. French writer and film-maker Chris Marker wrote after a visit to North Korea in 1957: “Extermination crossed this land.” It is today an indelible experience still drilled into the heads of every North Korean. The carpet bombing of North Korea was three years long, cruel, leisurely and cowardly. “After destroying North Korea’s 78 cities and thousands of her villages, and killing countless numbers of her civilians and over a period of three years or so, we killed off — what — 20 percent of the population,” Air Force Gen. Curtis LeMay, head of the Strategic Air Command during the Korean War, told the Office of Air Force History in 1984. U.S. bombers after killing a third of the North Korean civilian population cruelly and illegally destroyed hydroelectric and irrigation dams in the later stages of the war in order to kill remaining civilians through starvation and deprivation, flooding farmland, destroying crops and destroying civilian food supplies. This was an unforgivable atrocity that makes pale the destruction of Nagasaki and Hiroshima. Korea north of the imposed 38th Parallel lost nearly a third of its population of 8 – 9 million people during the 37-month long war. Russia and China were sided with North Korea in the Korean War of the early 1950s. China’s Chairman Mao in May 1950, agreed to join with the Soviet Union and support the North Korean invasion of South Korea. They are back but with some hesitation at going beyond their own interests. Russia’s Vladimir Putin wisely declared that North Korea is a nuclear nation and the world needs to accept that North Korea must be dealt with as such. China does not see how it can work with North Korea as a nuclear nation. That’s a little unrealistic because the DPRK has been a nuclear nation for quite some time, realistically speaking. Between China and Russia which each share a border with North Korea, they own a major share of the 15,000 nuclear weapons in the world. Both are preparing for nuclear war. Both have said they will not allow an attack against North Korea. Two days ago Russia tested an impressive ICBM and added troops to its border with the DPRK which continued the massive Russian buildup there. Russia and China have been conducting joint military exercises. They expect nuclear war and these two countries have the world’s wisest and most competent, calculating analysts on Earth. The United States’ corresponding planners and analysts work within a domestic propoganda-driven paradigm that excludes Earth and only contemplates American existence. That is a recipe for catastrophe. The lack of faith in Donald Trump to do the right thing and negotiate with the Nuclear Power, North Korea, is evident in the actions of every other nuclear power. Deeds speak. They are bracing for World War Three. USA Killed or Maimed people it called “savages” in the Pacific with its 100+ Nuke tests. The harm to people in the Pacific islands from the USA’s “Pacific Proving Grounds” included death, dismemberment, slow death, cancer and many long term chronic illnesses. Lives were shortened by three months to several decades. The USA was compelled to pay out as much as $1 billion in individual claims in ‘yesteryear dollars’ to Pacific Islanders. The “Study of Response of Humans -Exposed to Significant Beta and Gamma Radiation from High Yield Weapons” is foretelling of dire consequences. These facts are often recited by leaders and propagandists in North Korea. 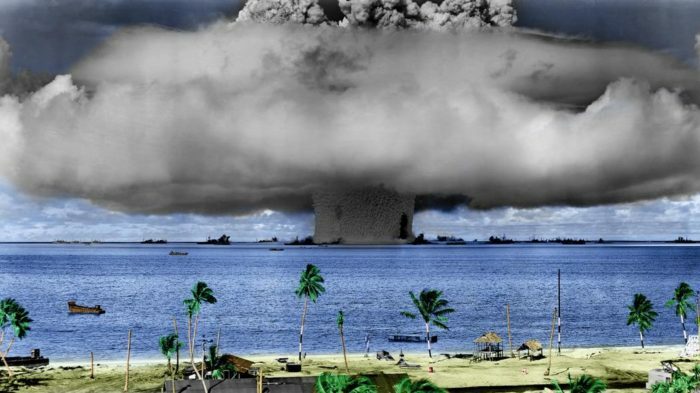 What will happen to you if a Hydrogen Thermonuclear Bomb explodes in the Pacific? If you are unprotected and unsheltered near a hydrogen bomb blast you will die immediately or very soon after the event. Nuclear war has no winners. Massive radioactive waves nearby underwater tests may overwhelm you and your home if you live on an island near a blast. On the limited evaluations of tests done already, that seems unlikely. Your biggest concern if you are far from a blast is that strong radioactive clouds will reach your home within the first seven days. Comprehensive studies have been conducted on underwater detonations. The blast throws up volumes of radioactive matter that becomes deadly particle clouds of radioactivity. Don’t let that fall on you. This will kill you and your children. The elderly and infants will succumb to radiation sickness the soonest. We are going to explain how to best protect your family in the event of a limited or extended nuclear war. Think about basements, underground shelters, safe rooms surrounded by dense substances like lots of concrete, steel and wood, any or all of these materials, and no windows. We will come back to this topic. And we will talk about how to prepare food for storage. To utter a valid threat of nuclear annihilation with intent against anyone is not a capability guidance, it is a statement claiming the measure of sickness of your mind. Radiation sickness results from nuclear fallout or nuclear blast radiation. The radiation does a severe attack on your body’s organs by invisibly bombarding your body’s cell structure with small particles that are destructive to all body cells upon impact. A small amount of radiation will damage organs and a large amount will destroy organs. It is not a pretty sight seeing a person die from radiation sickness. It is horrible beyond the worst science fiction movie depictions. Any person who knows this horrid outcome would need to be ‘evil’ or more scientifically precise, mentally and psychologically deviant to a high degree in order to escape their conscience and build such weapons. Nevertheless many people have done exactly that. Russia, USA, China, United Kingdom, France, India, Pakistan, North Korea and probably Israel have nuclear bombs. The best documented summary of nuclear tests can be found here in Wikipedia. Radiation sickness in any measure is a serious malady that has significant morbidity. Radiation sickness can force your death in minutes or it can shorten your life by months or years if you survive the initial symptoms. The measure of impact for survivors is dependent on how you were exposed; for how long; and to what measure of radiation. Hide from radioactive nuclear blast fallout. Be surrounded by thick, dense materials. There are many types of fallout shelters. If you do not have one, you may find yourself in public shelters, subway tunnels, mines, mountain tunnel roads, or your basement. Where would you go to shelter from a Tornado? Deep basements are very good. Get there. If you think war is coming to your region, prepare for the day when you need to take shelter by taking a shovel and piling up a meter of dirt to cover the basement windows. If you have survived a blast and think you have time to to do this before sheltering from fallout, get it done. Stay low in the basement and don’t come out until you have heard an ‘all clear’ signal or radio announcement. Beware falling debris, falling buildings and fire. If you have a shelter, it may be in a gully, trench or ravine and covered over with concrete. It may also be your basement. If you are near a nuclear blast and have survived without spending three seconds exposed to the blast, you are likely still functional. Your next immediate threat is from flying or falling objects like cars, rooftops, air conditioners, concrete chunks or blocks and garbage disposal containers. A nuclear explosion can throw up over 5,000 tonnes of materiel high into the sky. Duck. The closer you are to a nuclear blast the less you need to worry about immediate fallout and the more you need to worry about falling debris. 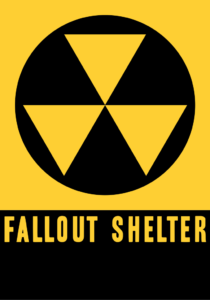 Don’t venture from your safe place (fallout shelter) unless you must and then only if you can find a protected route to where you want to go to find family members, pick up first aid kits and any last minute items you will bring to a shelter. Prepare your fallout shelter now. It will also be your “climate-change-extreme-weather” hideaway. Suppose you have decided your basement is the safe place to be. Your house is on the side of a hill facing the safest direction away from city centres and likely blasts. The hill blocks blasts from the city. Good choice. Go and store a fourteen day supply of food and water for yourself and each person who will be with you. We are going to give you some ideas for storing inexpensive items that will be safe to eat long after they have been placed in storage. Some suggested additional items include: a portable gas stove with a supply of propane bottles (at least 14 x 250 gram cans [about the size of an air-freshener can which you might also want to store]), battery powered portable radio, batteries for everything, flashlights, N95 breathing masks (if a family member gets sick because of a challenged immune system, don’t let the illness spread), blankets, first aid kit, general medicine( like analgesics, antihistamine, anti-inflammatory, bismuth subsalicylate (Pepto-Bismol and Kaopectate for radiation sickness symptoms) loperamide (Imodium)) medicine for family members who have chronic medical needs (like a spare asthma ‘puffer’), cell phone, a shovel, a utility knife, eating utensils, pencils and paper, a calendar, and disposable plates and cups. Remember this: You can survive for about thirty days without food but only maybe three days without water. You will die after three minutes without air. You cannot survive three seconds of exposure to a nuclear blast. Decide now what is the safest place in your basement or safe room. If you have a family member or friends who are handy with simple construction tools and methods, add a sand-bagged or cement-walled off area in your basement with a right angled entrance. Store your supplies there and plan to live in your fallout shelter for fourteen days at least. This will be your safe room for bad storms, tornado warnings, hurricanes, typhoons (unless basements flood in your area) and war. What will we eat while we wait in our fallout shelter 14 days or more for the “all-clear”? Think about each person in your family and their food preferences. Now think about their fist size. That is the volume of food, the volume of their fist, you will feed them each meal. On the first day of this shelter adventure, give each person water but no food. You will be exploiting their adrenalin rush which will lessen their hunger and at the same time shrinking their stomachs which will make the next fourteen days more comfortable. Remember, what comes in will come out so a portable toilet needs to be available and maintainable even if you have functioning plumbing to begin with. A metal bucket and plenty of plastic bags can suffice as a portable toilet but be sure to stock up with plenty of toilet tissue and baby wipes. You will appreciate this advise in good time. Don’t forget infant formula, multivitamins and medications as needed. Store as much water as you possibly can. Build wall or two of large stackable water containers. Suggestion: Print this page. Check the items off the list as you go. If these canned goods are unavailable to you, store food from the garden. Include what vegetables you have available like potatoes, chayote, cucumbers, squash etc and use your makeshift fallout shelter as their storage for regular consumption often replenishing the stock. You may also store dry rice but remember to also store extra water as it takes a lot of water to prepare rice. Do not under any circumstances save cooked rice. Consume what you cook on each occasion within two hours. Bacteria grow rapidly at temperatures between 40 °F and 140 °F; rice should be discarded if left for more than 2 hours at room temperature. You can actually survive a long time on just rice and water if you follow some rules. White rice, wild rice, arborio rice, jasmine rice, and basmati rice will last forever if kept dry and away from contaminants. Brown rice will last 3-6 months. A person who has been exposed to more than 1000 rads (10Gy) of gamma radiation is most likely to die. Don’t assume anything. Most radiation sickness cases will survive. Treat to live. Unless you have the facilities to evaluate exposure and begin bone marrow damage mitigation (filgrastim, sargramostim and pegfilgrastim may increase white blood cell production and help prevent subsequent infections) you can only treat the symptoms. A person in your midst who suffers from radiation sickness must be treated immediately. You may save them. There is a high probability that most cases of radiation sickness among those persons who stayed indoors and sought deep shelter will survive low-dose radiation sickness. Decontaminate the patient by discarding clothing and do thorough cleaning away from other occupants. If the patient is mobile and functioning, have them do this themselves flinging the bagged, contaminated items around the L-shaped entrance. Immediately treat physical injuries like burns and blunt trauma. Wash burns with lukewarm water. Discard water. Mitigate Bacterial infections. Give the patient an N95 mask. Headache – Treat with analgesic like paracetamol and not NSAIDs until internal bleeding is ruled out. Fever – rest and plenty of fluids. Nausea and vomiting – Drink water, sports drinks, or broths. Eat bland foods as tolerated. Is there a way to stop the Nuclear War. The solution is simple. This is what America, France, Britain, China, Russia, Pakistan, India and the United Nations must do to prevent a nuclear war in 2017. Welcome the DPRK to the nuclear club, immediately lift sanctions against North Korea, and sit down for talks on a new non-Proliferation Agreement. Plan to disarm multilaterally and start caring and sharing for human development instead of destruction. To do this America might need to engage a statesman to represent its new position and pull everyone to the table. Not Barrack Obama. Perhaps someone like Justin Trudeau or Emmanuel Macron would be willing to make the rounds to each nation and get this moving forward. Mothers, prepare for Nuclear War. The RINJ Women explained their concerns about Donald Trump and Kim Jong-un in late 2016. Women’s Scolding Rebuke of Dotard and Rocketman. A note to Donald Trump from The RINJ Foundation Women. Do not harm a hair on her pretty head. 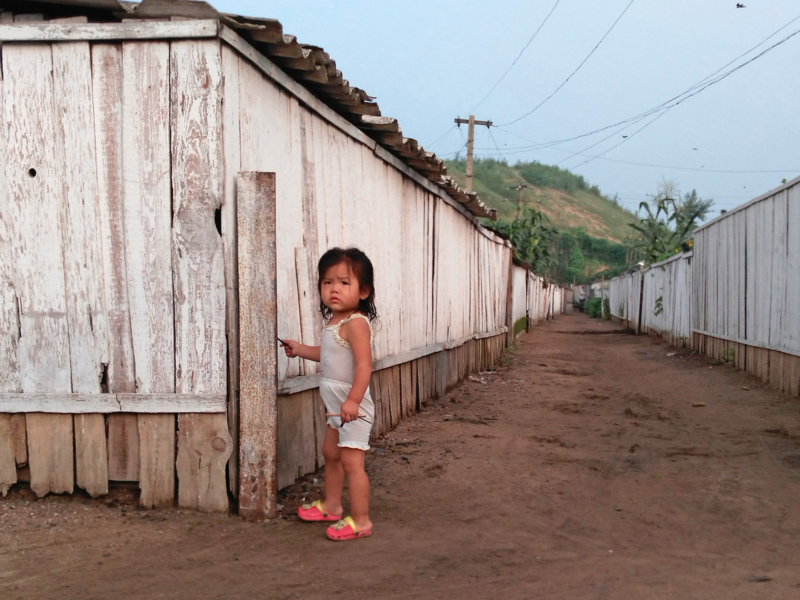 This North Korean Child Needs our protection, not angry, violent threats. She represents children and their families in East and South East Asia that you have put in harm’s way. Be a hero and solve this problem peacefully. Bring NK to the table with all nuke nations and talk multilateral de-weaponization of all nuclear technology. Then you will be a world leader instead of the dangerous enemy of all women and children. Boosted fission nuclear weapon: A type of nuclear weapon with a higher explosive yield than a regular fission weapon. A small amount of fusion fuel in the weapon increases the neutron flux, leading to a larger amount of the fissionable material undergoing fission, typically resulting in a higher yielding weapon. Counterforce targeting: War planning that envisions strikes on an enemy’s military and industrial targets. Countervalue targeting: War planning that envisions strikes on an enemy’s civilian population centers. Credibility Trap: Derived from Game Theory, credibility trap describes a situation where a leader has made an threat to another country. Once the threat has been made, the leader may feel compelled to follow through despite changing circumstances, in order to maintain the believe in the credibility of future threats. Electromagnetic Pulse (EMP): A sharp pulse of radio-frequency (long wavelength) radiation produced when an explosion occurs in an asymmetrical environment, especially at or near the earth’s surface or at high altitudes. The intense electric and magnetic fields can damage unprotected electrical and electronic equipment over a large area. First strike: The launch of a surprise attack intended to considerably weaken or destroy an adversary’s military infrastructure or nuclear forces, and thus severely reduce the adversary’s ability to attack or retaliate. First-strike capability: The ability of a country to launch a first strike against an adversary. First-use: The introduction of nuclear weapons, or other weapons of mass destruction, into a conflict. In agreeing to a “no-first-use” policy, a country states that it will not use nuclear weapons first, but only under retaliatory circumstances. See entry for No-First-Use. Fissile material: A type of fissionable material capable of sustaining a chain reaction by undergoing fission upon the absorption of low-energy (or thermal) neutrons. Uranium-235, Plutonium-239, and Uranium-233 are the most prominently discussed fissile materials for peaceful and nuclear weapons purposes. Fission bomb: A nuclear bomb based on the concept of releasing energy through the fission (splitting) of heavy isotopes, such as Uranium-235 or Plutonium-239. Fusion: Nuclear fusion is a type of nuclear reaction in which two atomic nuclei combine to form a heavier nucleus, releasing energy. For a fusion reaction to take place, the nuclei, which are positively charged, must have enough kinetic energy to overcome their electrostatic force of repulsion (also called the Coulomb Barrier). Thermonuclear fusion of deuterium and tritium will produce a helium nucleus and an energetic neutron. This is one basis of the Hydrogen Bomb, which employs a brief, uncontrolled thermonuclear fusion reaction. A great effort is now underway to harness thermonuclear fusion as a source of power. Gamma radiation: High-energy, short wavelength, electromagnetic radiation emitted from the nucleus. Gamma radiation frequently accompanies alpha and beta emissions and always accompanies fission. Gamma rays are very penetrating and are best stopped or shielded by dense materials, such as lead or depleted uranium. Gamma rays are similar to x-rays but have higher energies. Nuclear weapon: A device that releases nuclear energy in an explosive manner as the result of nuclear chain reactions involving fission, or fission and fusion, of atomic nuclei. Such weapons are also sometimes referred to as atomic bombs (a fission-based weapon); or boosted fission weapons (a fission-based weapon deriving a slightly higher yield from a small fusion reaction); or hydrogen bombs/thermonuclear weapons (a weapon deriving a significant portion of its energy from fusion reactions). Prague Speech: Refers to the speech given by U.S. President Barack Obama in April 2009 at Hradcany Square, Prague, the Czech Republic. In the speech, Obama stated “America’s commitment to seek the peace and security of a world without nuclear weapons.” He noted that “the United States will take concrete steps towards a world without nuclear weapons.” The Prague speech served as the framework for the 2010 Nuclear Posture Review and subsequent U.S. arms control efforts. Preemptive military action: An attack launched to preempt expected aggression by an enemy. In the context of nuclear weapons, this would involve striking nuclear arsenals or facilities to eliminate them before broader hostilities ensue. Preventive nuclear war: Preventive wars or attacks are launched in response to less immediate threats than faced in preemptive military action. Preventive attack is not motivated by the desire to strike first rather than second but rather the desire to fight sooner rather than later. Proliferation (of weapons of mass destruction): The spread of biological, chemical, and/or nuclear war weapons, and their delivery systems. Horizontal proliferation refers to the spread of WMD to states that have not previously possessed them. Vertical proliferation refers to an increase in the quantity or capabilities of existing WMD arsenals within a state. Proton: A particle with a positive electric charge located in the nucleus of an atom. Radiation (Ionizing): Radiation that has sufficient energy to remove electrons from substances that it passes through, forming ions. May include alpha particles, beta particles, gamma rays, x-rays, neutrons, high-speed electrons, high-speed protons, and other particles capable of producing ions. Radiation syndrome (also called radiation sickness): The complex of symptoms resulting from excessive exposure of the human body to acute ionizing radiation in a nuclear war for example. The earliest symptoms may include nausea, fatigue, vomiting, and diarrhea, which may be followed by loss of hair, hemorrhage, inflammation of the mouth and throat, and a general loss of energy. In severe cases, where the radiation has been approximately 1,000 rad (acute dose) or more, death may occur within two to four weeks. Those who survive six weeks after the receipt of a single large dose of radiation to the whole body may generally be expected to recover. Over the long-term, there are also stochastic health effects from radiation exposure (in contrast to acute effects), meaning an increased probability of cancers and other negative effects on a person’s health. Radioactive decay: The spontaneous emission of energy and/or particles from the nucleus of a radioactive atom. This is most often in the form of either alpha or beta particles, gamma radiation, or spontaneous fission where the nucleus undergoes fission without the bombardment of a particle or photon. Each radioactive isotope has an associated half-life, and the amount of radioactive material decreases over time as the material decays. Radioactivity: The spontaneous emission of radiation, generally alpha or beta particles, often accompanied by gamma rays, from the nucleus of an unstable isotope. Radioisotope: An unstable isotope of an element that decays or disintegrates spontaneously, emitting energy (radiation). Approximately 5,000 natural and artificial radioisotopes have been identified. Some radioisotopes, such as Molybdenum-99, are used for medical applications, such as diagnostics. These isotopes are created by the irradiation of targets in research reactors. Radiological dispersal device (RDD): Radiological dispersion device (RDD): Any device, other than a nuclear explosive device, designed to spread radioactive material (sometimes called a dirty bomb). Radiological terrorism: Terrorist acts intended to release harmful radiation, through sabotage of a nuclear facility or the detonation of a radiological dispersal device (RDD). See radiological dispersal device. Thermonuclear weapon: A nuclear weapon such as the one North Korea has been testing in 2017 in which the fusion of light nuclei, such as deuterium and tritium, leads to a significantly higher explosive yield than in a regular fission weapon. Thermonuclear weapons are sometimes referred to as staged weapons, because the initial fission reaction (the first stage) creates the condition under which the thermonuclear reaction can occur (the second stage). Also archaically referred to as a hydrogen bomb.